The Internet is a limitless recipe resource, but separating the wheat from the chaff can be a real chore. Most searches turn up giant recipe databases with directions of dubious quality, usually with no images to inspire and help you along. These are recipes that I either found on the Internet, I made up myself, or are based on old family recipes. I post new recipes as I try them out. That means that all the recipes here have been tested by me and my family. I have tried to give credit for those recipes of others that may be listed here. If I have included your recipe without acknowledgement, please contact me and I will either delete it or give you credit for it’s source. So if you are so inclined; I can guarantee each and every one of these recipes will work for you and produce fantastic results. Tips: Looking for a refreshing salsa for a warm summer evening? This is our favorite. This salsa will have you eating it with a spoon! It is soooo good.It is best to make it the day you are going to use it. 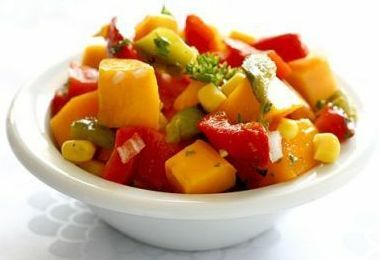 Mango salsa is an exotic alternative to the more common tomato salsa. I used the Ataulfo variety, you could use almost any kind of mango, but I think the vibrant deep orange color of Ataulfo mangoes really pops in the salsa. Just as important, the texture of the flesh is smooth with no unpleasant fibers. In a small bowl prepare dressing, combine the agave nectar, the juice of 1 lime, mustard, Tabasco sauce, ginger garlic paste. Whisk avocado and olive oils. Adjust seasoning with salt. Set aside. In a serving bowl, combine the shallots, tomato, corn, bell peppers and jalapeño. Add the parsley. Drizzle with spicy salsa dressing. Toss to combine. Adjust seasoning if needed. Let sit for about 5-10 minutes before serving to let all the flavors blend together. Serve at room temperature. Recipe with picture adapted from http://www.phamfatale.com/ by Jacqueline Pham. Tips: This is a fabulous, quick and easy recipe that will impress your guests. Make it in advance and keep refrigerated, serve chilled. Top each serving with a tablespoon of granola just before serving. 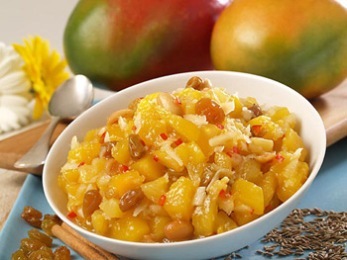 Tips: This is the best mango relish I have ever tasted! It’s a refreshing, cool and spicy yet sweet relish that adds excitement to sandwiches, gingebred or tortilla chips! You’ll love it! Fresh produce is mandatory. The spiciness is pepper dependent, so sample to know your ingredients. In a medium saucepan, combine the mango, pineapple, raisins, water, sugar, cumin and cinnamon stick. Bring to a boil; reduce heat and simmer for 15 minutes. Stir in remaining ingredients and simmer over low heat for 30 minutes more until thickened, adding a little water if necessary. Tips: Use mango ice cream instead of Vanilla ice cream. If Ice cream is smooth and pliable, place all ingredients in a blender and set to a medium speed. Puree until the ingredients are smooth, and serve. If ice cream is very stiff or frozen solid, simply place it in the refrigerator for 1 hour to let it soften up. Garnish with pieces of pistachio nuts when glass is full. 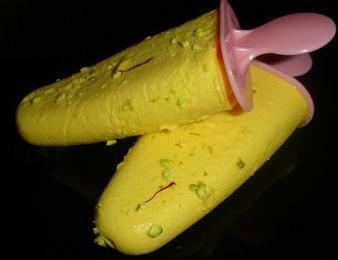 Tips: It is cake of fresh mangoes with rich cream topping. It has a very strong flavor of mango one must try at home for kids. Hope you enjoy this as much as my family. Take vanilla sponge and split into three layers (horizontally). Make sugar syrup; dissolve sugar in water with Lil amount of mango essence. Now sprinkle prepared sugar syrup over each layer of cake sponge. Take first layer, put it onto the plate or cake base then sprinkle syrup then whipped cream mixed with mango puree and chopped mango. Spread it all over the first layer. Do this same process with other two layers. Now cover the whole cake with whipped cream and decorate it with cut chocolates and mangoes or with other choice fruits. Tips: One reason to love summer is fruits! And the best of them all is of course Mango, the king of fruits 🙂 Great addition for the summer holiday parties! This one will go in no time! Everyone will love it. Fresh, light, and absolutely fabulous. Preheat oven to 425. Cut the mangoes and scoop out the flesh into a medium-sized bowl. In the same bowl combine the rest of the ingredients and mix well. Let stand for 15 minutes. 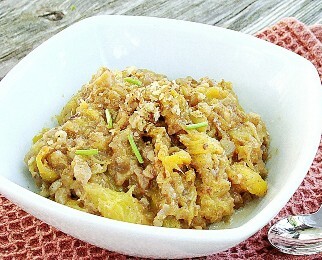 Pour the mango mixture into a baking dish and bake for 10 to 12 minutes, or until browned on top. Serve warm. Tips: I love the unique taste of Kesar mangoes. The fruit is so soft and juicy that we usually just cut them in halves and scoop the flesh out. If you’re looking for something special to serve for your Memorial Day weekend barbeque, mango lemonade could be it. Peel and pit the mangoes; gather the flesh and the juices. In a saucepan, combine the sugar, mango flesh and gathered juice. Bring to boil and stir to dissolve the sugar. Lower to a simmer and cook for about 3-4 minutes. Allow to cool to room temperature, then cover and refrigerate until chilled. Turn the mangoes into a smooth purée using a blender or hand-held blender. You might want to add a little water for a smoother flow. Add mango extract (if used). Strain through a medium-mesh sieve. Discard the solids (if any) to remove any fibers. Set aside in refrigerator. 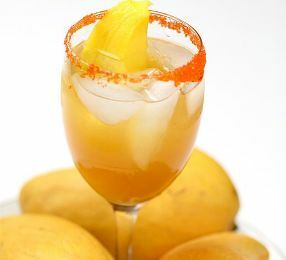 When you’re ready to serve, combine the mango mixture, lemon juice and ice cubes in a large pitcher. Complete with water. Serve over more ice in pretty glasses. Slice fresh mangoes (or lemons) for decoration. Stir and enjoy with tea cakes or cookies.It’s so refreshing! Tips: Every mango lassi recipe you’ll find always has the same list of ingredients. Milk, yogurt, mango, sugar and some crushed ice are always present, though the proportions may differ. To these, I added cardamom extract, saffron (for color) and a pinch of salt to enhance the flavor of the mango. There’s something magical about mango lassi (Indian-style smoothie). It has the richness of a milkshake without the calories. On top of that, it’s ultra easy to make at home. You don’t have to wait for your next trip to the local Indian restaurant to enjoy a tall glass of mango-ey goodness. In a mortar and pestle, grind the saffron threads (if used). Add about 1/4 cup of milk and soak for 10 minutes. 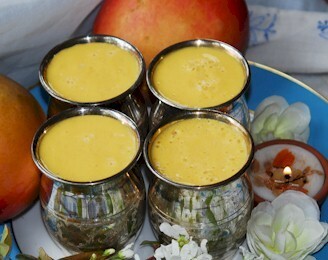 Combine the mango purée, yogurt, saffron milk (if used), the rest of the milk, sugar, salt and crushed ice in a blender. Blend all the ingredients for about 2 minutes. While the mixture is blending, add the cardamom extract (if used). The consistency of the smoothie should be smooth and creamy. Pour into 6 small glasses. Wasn’t it easy? Enjoy! Soften the cream cheese till light and fluffy, then add sugar, milk, mango purée, cardamom and saffron mix well. 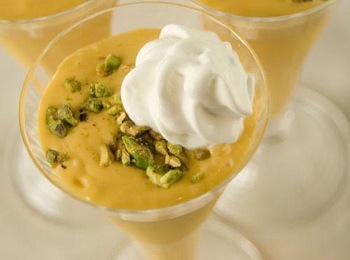 Then add the whipped cream, mango spread, chopped pistachios and gently fold in. Mix cornstarch in lukewarm water, the cornstarch should be well dissolved in the water, then add this to the mango mixture, mix well. Now pour the creamy mango pulp to the moulds and freeze for for about 3-4 hrs. YUMMY….YUMMMY…CREAMY ICY TREATS ARE READY TO GO…. Tips: Pure Indian desert that we call ‘mango kheer’. It takes a litle more than one hour, but is is worth it. Wash and rinse the rice/tapioca thoroughly. Place in a large bowl, cover with water. Soak for at least 1 hour or preferably 2. Drain as much water as possible. Fill a small pot with about 3 quarts of water. Bring to a boil. Add the rice/tapioca. Bring the liquid back to a boil, then immediately lower the heat to a gentle boil. Cook for about 3 minutes. Drain the liquid from the rice using a fine mesh colander. Do NOT rinse. Discard the liquid. Rinse the pot. In the same pot, add 2-½ cups of milk. After bringing the milk to a near boil, return the rice/tapioca to the pot. Reduce the heat to medium-low. Cook for about 20-25 minutes at a gentle simmer, stirring frequently. This way the rice/tapioca is cooked all the way through evenly. The liquid should be all absorbed. Sweeten with sugar. Periodically add ½ cup of remaining warm milk (add all the rest of the milk whenever the pudding thickens). Add salt and cinnamon (if used). Keep stirring the rice/tapioca every now and then so that it doesn’t stick to the bottom of the pot. Let simmer for another 10 minutes or until done. Slowly add the butter and stir until fully incorporated. Add 8 tablespoons of mango purée. The pudding will turn into a pretty golden color. Cook over low heat for 5 minutes until thickened and creamy. Turn off the heat. Add mango extract. Stir well. Allow the pudding to cool completely. Refrigerate for atleast 4 hours. 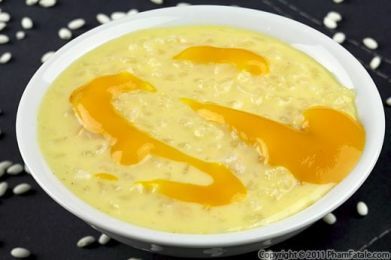 When serving, fill a large bowl with the mango pudding, drizzle with 2 tablespoon of mango spread. serve chilled. Tips: I wanted to utilize the mango season completely and no mango recipe collection is complete without a mango cake…Agree? Sift all purpose flour, baking soda, baking powder and salt atleast twice for even spread of baking powder and soda. Now add semolina to the mixture, keep aside. In a seperate bowl, add oil, yogurt, mango pulp, cardamom powder, sugar and mix well till sugar is completely dissolved. Now add the yogurt mango mixture to flour mixture slowly and mix until a thick batter is formed. Add chopped walnuts and mix once. Reserve 1 tbsp of walnuts for topping. Preheat the oven at 190 degree centigrade. Meanwhile grease the pan with little oil and sprinkle some all purpose flour. Arrange butter paper if you use it (I use for most of the cake for easy unmoulding). Transfer the batter to the cake pan. Top the cake batter with remaining chopped walnuts and bake it for 35-40 mins at 190 degree. I use butter paper these days as its mess free to unmould and cleaning the pan is also easy. For this recipe I have used a bread loaf pan. 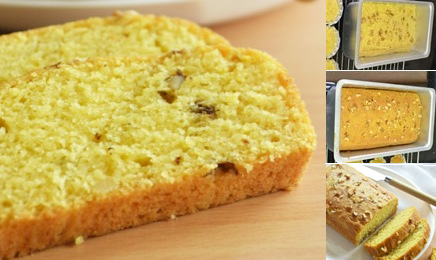 Adding semolina gives a wonderful texture to the cake. Mango and cardamom combination is heavenly so dont skip it. 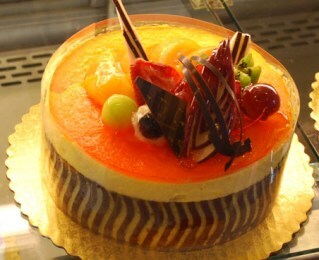 As the cake uses mango pulp, it keep well only for 2 days. Dont refrigerate the cake, as it would become hard. Tips: Do you know a pie with out baking!!!!!!!! Many of you out there must be knowing it…but I came to know about it only few year back…I heard it from a friend and gave it a try….from then on….it became a frequent visitor to my house….especially my little princess is a huge fan of it….Mango in any dish gives it a heavenly taste…………that too with cream and cheese, HAAAH enhances it’s taste much more…..once such delicious delicacy is this Mango Pie. Soften the cream cheese until creamy and fluffy. Take the mango purée, softened cream cheese and cool whip cream, just fold them in. Stir in sugar. Dissolve 1 packets of gelatin in 4 fl oz. lukewarm water, add this to the mango mixture and mix it well. Now using a hand blender make a smooth and consistent mixture (beat about 2 min). Pour this mixture in a pre-made pie crust and refrigerate for at least 4 hours before serving. 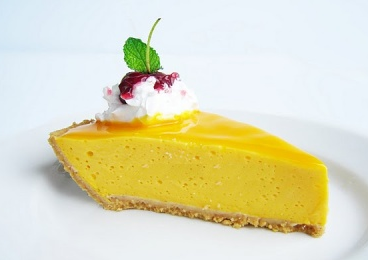 Enjoy this yummy pie with a dizzle of mango spread and a little scoop of whipped cream…….yummm.